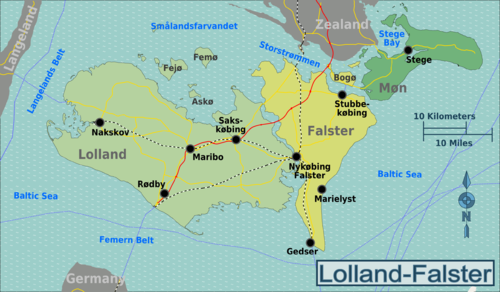 Includes good beaches, and Denmark's southernmost point, Gedser, where you can jump on a ferry to Germany. The "sugar island", supplies the sugar for almost all the tasty Danish pastry. Known and loved by the Danes for its scenic country side, Viking burial mounds and its spectacular chalk cliffs. This page was last edited on 7 September 2015, at 11:00.